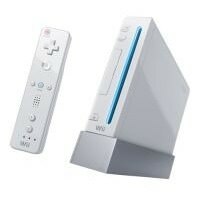 I’d like to get a Wii, but I’m not willing to buy a whole bundle for $500+ and get four games, three of which I’m not interested in. I’m also not interested in waiting on line at the Nintendo store before 7 a.m. hoping to get one of the 12 or so that they might sell that day. I can wait for the day that I can walk into any Best Buy or Circuit City and just buy the base $250 unit and the one additional game I might be interested in. In an effort to find a Wii, I’ve added a Wii tracker to my RSS reader in case someone has the base unit for sale online. This morning, I found out that Kmart has just that. 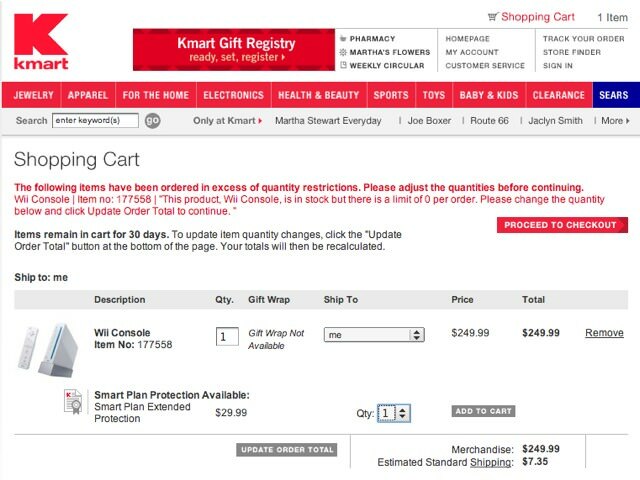 Over my morning cup of coffee, I went to the Kmart site, and attempted to order the Wii. When I added it to my cart, I was greeted by a message that, especially with my slow-morning-brain, I found quite perplexing. So how exactly does one go about and order one from Kmart? They have them in stock, but have a limit of 0 per order. Oh well. Guess it’s not meant to be at this time.